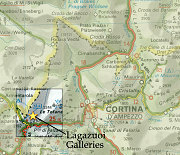 The Lagazuoi galleries are an interesting remnant from the mountain battles of World War I. 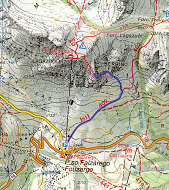 In this particular instance, Italian and Austrian troops were fighting for control of the Lagazoui summit. The Austrians had control of the summit, and, in an attempt to wrest it from their control, the Italians constructed (over many months) a labryinth of tunnels up through the mountain to try and reach, and blow up, the Austrians. The remnants of this network still exists today, and has been protected in the style of a ferrata for much of its length. Storerooms, barracks, passageways, and other artifacts are well preserved and still visible. It is indeed a sort of museum, and is fascinating not only for the scenery of mountains but also for its historical aspect. From the parking lot of the cable car leading to the Lagazuoi summit, trail #402 leads obliquely upwards to the northeast. Along the way, you can see many war remnants in the cliffs above. The view over to the cinque torri and to the Tofane group are superb. Eventually a sign is reached indicating the way up to the Lagazuoi galleries. After a bit of switchbacking trail, the first short tunnel is reached, followed by a bit of very easy ferrata. 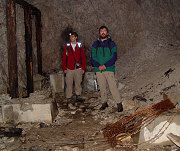 This leads past some war relics and to the start of the main tunnel system. From here you will definitely need a headlamp. The tunnel leads up (there are steps) into the mountain. Be careful if the temperature is near freezing because it is possible for the steps to be glazed with ice. After a long while there are some side windows which poke out in the middle of sheer rock faces; eventually the start of the tunnel network itself is reached. At this point, there are many branches, rooms, and levels; some of the rooms still have artifacts from the first world war. Very interesting. There is a map posted on the walls, and if carefully followed you can make your way up to a sub-summit of the Lagazuoi mountain (as in you exit out of a door onto the summit). From here it is possible to hike up to the actual summit, which is where the cable-car from below terminates. When we went it was late and snowy, and we did not have the proper gear to make the journey nor were we sure that the cable-car was still running, and so we returned down the way we came, after exploring many of the side branches and rooms.